“We all know throughout the city, we have Peru Square, Dominican Republic Way, Colombian Corridor. It will be nice to have Bangladesh Boulevard,” said Kobir Ahmed, a member of the Paterson Planning Board, to the council. Members of his community packed the City Council chambers. 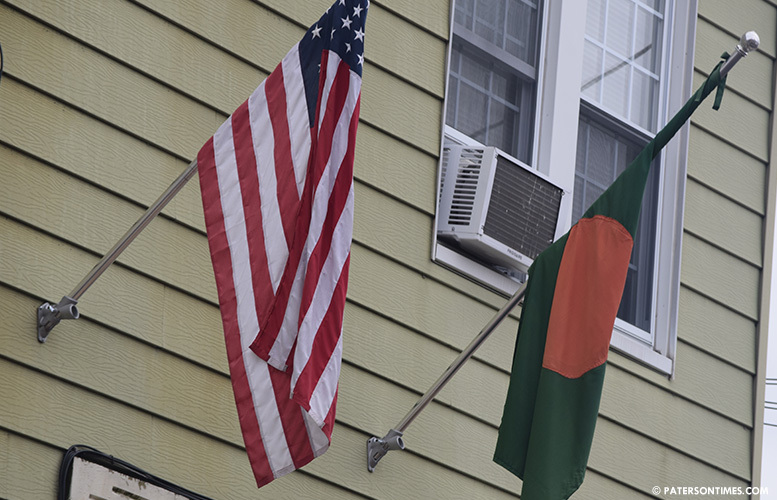 As many as 15,000 Bengalis call Paterson home, said Ahmed. Bengali businesses dot both sides of Union Avenue. The sudden appearance of his countrymen bearing petitions surprised councilman Shahin Khalique. Khalique, who is the second Bengali to hold the 2nd Ward council seat, ascribed political motives behind the petitions. He ousted then-incumbent Mohammed Akhtaruzzaman, who was the first Bengali elected to the City Council, in 2016 to win the seat. He won in an election badly marred by fraud. Some of his supporters collected mail-in ballots through fraud and intimidation, according to voters who testified in the year-long trial. 22 mail-in votes were invalidated in the trial. Others were revived from the rejection pile, allowing Khalique to ultimately win the case. Ahmed is an Akhtaruzzaman ally. “You guys try to divide the community not unite,” Khalique told the crowd. He digressed from the topic at hand and began to criticize and attack his old rival. Khalique accused Akhtaruzzaman of lying about his residency when questioned by the community’s elders. Both men had moved out of Paterson. Akhtaruzzaman returned from Totowa to run for office in 2012; Khalique returned from Wayne to run for office in 2016. Khalique acknowledged he supported Akhtaruzzaman in 2012. He even donated to the former councilman’s campaign, he said. Akhtaruzzaman divided the Bangladeshi-American community when he tried to name Van Houten Street to Alhaj Forman Ali Street, said Khalique. The mosque on Van Houten Street opposed the street naming and filed a lawsuit against the city. A portion of Van Houten Street was named Jalalabad Street following the debacle. Khalique said Akhtaruzzaman has been making videos and sharing them on social media claiming credit for a variety of things. He said the videos are filled with “lies.” In one video Akhtaruzzaman, according to Khalique, talks about calling the mayor and PSEG to address road resurfacing on Totowa Avenue. Khalique said in another instance Akhtaruzzaman shot a video on the Wayne Avenue bridge opposing proposed lane reduction. The Council has taken up the issue and a suggestion has been made to raise concerns of further traffic bottleneck on Wayne Avenue to the county engineer, he said. Khalique further said Akhtaruzzaman opposed the ill-fated Bangladesh parade that took place some years ago. An emotional Khalique said Akhtaruzzaman “lies so much” that he accused his deceased father of casting a vote in the 2016 election. “Do you know how hurtful that is?” remarked Khalique. “We were not the ones that caught him. Passaic County election officials caught him,” responded Akhtaruzzaman. Khalique’s father Abdul Khalique is recorded as having cast a ballot in the 2nd Ward race. The father had died two years earlier and could not have voted. But his son has been making a bizarre argument to assert the obvious that his father did not vote. The example highlighted a serious problem in the 2nd Ward election. When told Khalique accused him of misleading his community with videos, Akhtaruzzaman said, “We’re talking about a family of fraud. Now he’s bashing me.” He pointed to an alleged real estate scam that involved Khalique’s brother, Shelim Khalique. A lawyer involved in the scam pleaded guilty in October. Shelim has not been accused of any criminal wrongdoing. One victim sued Shelim. The case was settled. Akhtaruzzaman said Shelim had to return the man’s Birch Street property as part of the settlement. The street naming has been talked about for years. One group, World Glam Entertainment, which was behind the Shohid Minar Monument at Westside Park, first proposed it. A speaker at the City Council meeting said Khalique opposed building the Shohid Minar Monument. Khalique denied it. Sayegh revived the street naming proposal while campaigning ahead of the May mayoral election. He made the announcement to additionally name Union Avenue in September. After his long diatribe, Khalique asked, “So, who is dividing the community?” Both Khalique and Akhtaruzzaman have divided their community for politician gains. For example, Khalique endorsed Alex Mendez and Akhtaruzzaman backed Pedro Rodriguez in the mayoral race. Bengalis largely ignored both men and overwhelmingly voted for Sayegh. Council president Maritza Davila said no one on the council is opposed to the street naming proposal which remains in committee. Can Americans go to all of these countries and rename the streets? As long as we are all changing names, How about changing City hall to the Kremlin?